The Isaac Brock Society | Happy Independence Day! Here is a question: Do Canadians have the Fourth of July? Yes, but they don’t celebrate it. I just want to express my congratulations to the growing list of Brockers who have received their Certificates of Loss of Nationality. For you, the Fourth of July is just another day of the month of July. We are celebrating our Independence Day. Not independence of the United States of America from the British, but independence for expat slaves from the United States of America. In the meantime, my correspondent on expatriate matters, the very well informed and thoughtful Victoria Ferauge (resident in Versailles), tells me that many nonresident US citizens are getting tax compliant precisely in order to cut the citizenship cord without the IRS getting in the way. That’s too bad. The US is the only OECD country to tax non-resident citizens. Most are getting caught in a dragnet aimed at much bigger fish and the different problem of asset offshoring. Just as other countries are looking to cement ties with non-resident citizens, the US seems to be scaring its away. The better fix for all of this would be to roll back FATCA as it applies to ordinary Americans overseas, eliminating the need to become un-American. In the meantime, we will almost surely see more fellow citizens heading to the exits. Congratulations to Victoria for being noticed. Becoming a non-US citizen is a great matter of rejoicing for these reluctant Expats. Once they announce to the others their reception of their CLN in the mail, they receive multiple expressions of congratulations. I know people who feel great relief at receiving their CLN and have expressed to me how happy they are. How many countries in the world do you know that people literally congratulate its former nationals when they receive proof that they are no longer citizens of that country? This is proof positive that US citizenship is the worst citizenship in the world. So happy Independence day, you Americans. But for me and many thousands of people, we are glad to be independent too: independent from America. I am looking forward to going to Toronto on July 15th to relinquish. I became a Canadian February 19, 1993. I rejoice that I am Canadian and independent of America. I will look forward to getting my CLN. I may frame a copy and hang it next to a copy of my Canadian citizenship paper. Best wishes to you northernstar. We’ll be with you in spirit, and rejoice with you as you get your freedom papers. @northernstar, It is important to use the correct language. You do not go “to relinquish” but to inform a consular officer of your prior relinquishing act which was done with the intention of losing United States citizenship. I.e., you relinquished in 1993 and have not been a US citizen for twenty years. You are now informing them of this so that they do not confuse you with an American citizen (i.e., a slave of the the United States federal government). Form OMB No. 1405-0178 Request for Determination of Possible loss of US citizenship. question 12 b is tricky,,,asks if I did own property in Canada. I just rented until I bought a home in 2001..after I got my canadian citzenship…I sold that, bought another one in 2005 and sold that and now just rent…How do I answer that? as there was no ownership up to 1993 and after until 2001? my parents are dead and I have siblings who hate me…so should I just say I have siblings and parents dead and leave it at that. Can I download these forms so I can type in the answers .? I just printed from the govt site. 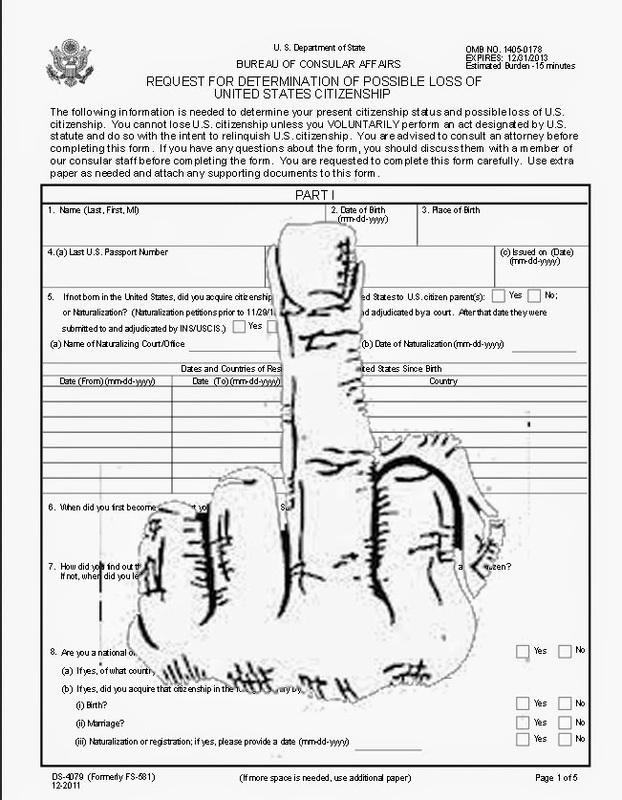 The forms I filled out were DS 4079 and DS 4081 which are both available as fillable pdf (so that they can be filled out on your computer and printed already completed). If the links in the above post don’t still work, just google the forms. DS 4083 will be completed by the consular officer. It doesn’t matter if you rented or owned. What matters is that you lived in Canada or otherwise outside of the United States. It doesn’t matter whether your parents or siblings live in the US. It doesn’t matter whether you have a good relationship with them or not. Congratulations to all Brocker’s who’ve found their freedom from tyranny. Speaking as a US citizen, it’s hard to imagine our difficulties being even ACKNOWLEDGED by the US government, let alone having one that works to “actively promote their expatriate citizens.” What a pity and loss it is to America that even the former action by the US government may have stemmed the loss of the many very fine citizens who now feel nothing but disdain for their former nation. When the pursuit of tax cheats takes precedent over the loss of its fine citizens, it is a strong indicator that the US has succumbed to the deadly sin of avarice. Re question 12(b) I have never owned property, but wanted to make clear I was well established here. Re question 13(c) No need at all to mention deceased persons. As for living family, you could write “brothers and sisters,” or “2 brothers and 1 sister,” whatever. “Do you have family or social ties? They won’t ask anything about your family members. It’s basically immaterial to a relinquishment claim. They don’t ask much, if anything, at all. They read the questionnaire whilst you’re in the waiting area. If something on the 4079 isn’t clear to them, they’ll ask. But in general, the 4079 speaks for itself, so they don’t ask about anything in it. The meeting itself at Toronto runs around 10-15 minutes. Thank you for the advice. I have a question need clearing up. I rented up to 2001 , way after my 1993 citizenship..So I should not put down that I owned after that day, one home bought in 2001 and sold in 2005 and bought another one and sold that one in 2009….So I don’t mention that I bought them? It is after my citizenship date. Also I have one son in UK…and no other family, just friends. Both my sons were registered at the counsel, The one in UK has a Cdn passport and US passport (which I never thought he should have gotten) I just don’t want to trip and be telling any lies. The deceased son only had a Canadian passport. I’d stick in the rented (even though they only ask about owning) because it does establish your presence here. The 4079 only asks if you have family, friends, property, etc, in Canada and the US. I haven’t heard of them asking about the child if a person answered yes. (Basically State doesn’t seem to be interested in making more work for itself, eg trying to find possible citizens around the world). Maybe some people who answered yes on 13(g) can reply with their experience on this. I’m pretty sure that someone who had who did their relinquishment CLN at Toronto told me they had answered yes to that question, but no questions were asked. I’ll see if that’s in my notes. did not commit. In practice, it encourages the children to also renounce their U.S. citizenship. necessarily have foreign assets. The IRS’s one size fits all policy and bait and switch tactics led to abuses of Americans abroad which inspired sharp criticism from the National Taxpayer Advocate. American clients. FATCA creates a barrier to free movement of capital and people. We dare not forget today that we are at the forefront of the Second American Revolution. Let the word go forth from this time and place, to friend and foe alike, that the torch has been passed to a new generation of Americans Abroad –born in this century, tempered by the Homeland FBAR, FATCA and OVDI attacks, disciplined by a hard and difficult road to tax compliance, proud of our commitment to the ideals of what America was once–and unwilling to witness or permit the slow undoing of those human rights to which Americans Abroad have always been committed, and to which we are committed today in the Homeland and around the world. Let the Homeland know, even though it wishes us ill, that, as law abiding citizens, in full compliance with the law, we shall pay any price, bear any burden, meet any hardship, support any friend, oppose any foe to assure our human rights as citizens of this world. That to secure these rights, Governments are instituted among Men, deriving their just powers from the consent of the governed, That whenever any Form of Government becomes destructive of these ends, it is the Right of the People to alter or to abolish it, and to institute new Government, laying its foundation on such principles and organizing its powers in such form, as to them shall seem most likely to affect their Safety and Happiness. Prudence, indeed, will dictate that Governments long established should not be changed for light and transient causes; and accordingly all experience hath shewn, that mankind are more disposed to suffer, while evils are sufferable, than to right themselves by abolishing the forms to which they are accustomed. But when a long train of abuses and usurpations, pursuing invariably the same Object evinces a design to reduce them under absolute Despotism, it is their right, it is their duty, to throw off such Government, and to provide new Guards for their future security. Such has been the patient sufferance of these Colonies; and such is now the necessity which constrains them to alter their former Systems of Government. The history of the present Ruler of United States of America is a history of repeated injuries and usurpations, all having in direct object the establishment of an absolute Tyranny over these Emigrants. To prove this, let Facts be submitted to a candid world. He has dissolved Representative Houses of emigrants repeatedly, for opposing with manly firmness of his invasions on the rights of the people. He has endeavoured to prevent the population of these States; for that purpose obstructing the Laws for Naturalization of Foreigners; refusing to pass others to encourage their migrations hither, and raising the conditions of new Appropriations of Assets. He has obstructed the Administration of Justice by refusing his Assent to Laws for establishing self-Judiciary Powers. He has made IRS Judges dependent on his Will alone for the tenure of their offices, and the amount and payment of their salaries. He has kept among us, in times of peace, Standing Armies of Tax Collectors without the Consent of our legislatures. He has affected to render the Revenue Service independent of and superior to the Civil Power. He is at this time transporting large Armies of foreign Mercenaries to compleat the works of confiscation, desolation, and tyranny, already begun with circumstances of Cruelty & Perfidy scarcely paralleled in the most barbarous ages, and totally unworthy the Head of a civilized nation. He has constrained our fellow Citizens taken Captive on the high Seas to testify against their Countrymen, to become the executioners of their friends and Brethrens assets, or to fall themselves by their Hands. He has excited domestic insurrections amongst us, and has endeavoured to bring on the inhabitants of our frontiers, the merciless Bank Savages whose known rule of warfare, is an undistinguished destruction of all ages, sexes and conditions. Nor have We been wanting in attentions to our United States brethren. We have warned them from time to time of attempts by their legislature to extend an unwarrantable jurisdiction over us. We have reminded them of the circumstances of our emigration and settlement here. We have appealed to their native justice and magnanimity, and we have conjured them by the ties of our common kindred to disavow these usurpations, which, would inevitably interrupt our connections and correspondence. They too have been deaf to the voice of justice and of consanguinity. We must, therefore, acquiesce in the necessity, which denounces our Separation, and hold them, as we hold the rest of mankind, Enemies in War, in Peace Friends. _______ is a Homelander. Therefore, he will never be able to understand what ex-pats are going through unless he was to leave the Homeland and put down roots elsewhere. Today’s ex-pats have much in common with the American colonists who declared independence from the British Homeland in 1776. The colonists faced then, like ex-pats face today, TAXATION WITH NOTHING IN RETURN from the HOMELAND–a direct result of having NO REPRESENTATION in the Homeland’s legislature. I believe it was called TYRANNY back then. The American colonists “whined” about it then just like today’s ex-pats are “whining” about it now. The result will be the same–whining didn’t work back then, just like it won’t work now. However, what did work then and what will work now, is formal RENUNCIATION / RELINQUISHMENT OF THE HOMELAND’S CITIZENSHIP. It is the only solution if an ex-pat wants to survive and live at least a semi-normal life. So ______, if you happen to be reading this, sorry for sounding so anti-American, no ex-pat wants to sound that way. But enough is enough! No man or woman worth their salt can tolerate living under such conditions. America’s founders didn’t tolerate it, why should anyone else? My wife is just starting her Canadian citizenship application process this September. ~sigh~ Took her that long to realize that the USG was a malevolent leech of epic proportions. Happy “THANK GOD I’M NOT AMERICAN” Day today. And to those of you who have successfully ditched that leech-like citizenship and kicked it to the curb…Congratulations on your FREEDOM DAY! When I get my CLN …I will be able to really say that…but I do feel that right now…Have felt that since 1993…when I turned Canadian. Remember crossing the border in 1969 and feeling so happy. Come to think of it, isn’t the middle finger kind of redundant? I know, but I figured it was pretty much a great way to tell the DoS off. bubblebustin, this is the one I really want to send…to the IRS.